Hello all my crafty friends 🙂 First before I get into my card I have to apologize for being gone the last few months. I had some health things I was dealing with and life just got crazy busy. I’m back now and things are going pretty good. So, now about my card…. I’m so super excite to share it with you today. Mostly because I’ve been learning Adobe Illustrator and created an adorable cat with a pumpkin (Free SVG and digi stamp, and more download below). This card was actually pretty easy to create. I cut my Cat With Pumpkin SVG file out with my Cricut Explore. I inked all the edges using American Crafts pigment ink. I do have to say I love this ink but boy does it take forever to dry, lol. 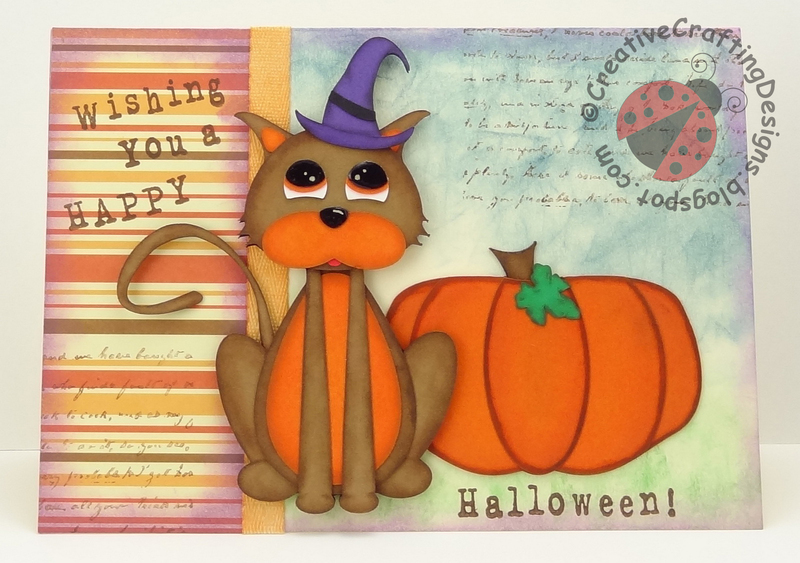 I then added chalk (miscellaneous from my craft stash) to give the cat and pumpkin more texture and depth. So, with the pumpkin I made the mistake of chalking before the ink dried, which made the edges much darker then what I planned. Thank goodness I ended up being happy with the look. I did wait until the ink dried on the cat before chalking, it gave it a much softer look. For the nose and the black parts of the eyes I used a Sakura white Gelly Roll pen to add the white detail. I then added some Ranger Glossy Accents to give it some shine. This was the first time ever using Glossy Accents, I really like it but for some reason mini bubble showed up after it dried. Now on to the card base. I used my American Crafts pigment inks again and a makeup sponge to create the sky and grass effect. I pulled some striped patterned paper from my craft stash, thinking the fall colors looked great with the cat and pumpkin. But, I quickly realized between the sky, grass and patterned paper, there was no purple to bring out the purple in the witches hat. After spending hours searching through all my paper stash, not finding the right color combinations to get the look I wanted I decided to use some purple ink and add it myself. I ended up fading it in from all the edges and corners using a makeup sponge. I still felt like something was missing from the background, I decided on using my Inkadinkado Scrip Background Stamp (8347 Y). It’s one of those stamps I’ve had for ages and never used. I love how it came out, so much, that I can’t wait to use it again. Oh, you’ll see in the picture the script is a little faint in color, that is because I stamped it twice on scrap paper before applying it to my card. For the sentiment “Wishing You a HAPPY Halloween!” I used another stamp set I’ve had forever but never used; Making Memories Magnetic Strip Alphabet. It’s like getting something new, pulling out all my supplies I bought in the past and finally using it 🙂 I used brown AC pigment ink to stamp my sentiment. Let’s not forget the ribbon… It was actually cream colored Celebrate It ribbon. I didn’t have the right shade of orange so I laied it on a piece of scrap paper, using some orange AC pigment ink and a makeup sponge (cut into small pieces), I inked over the ribbon. It came out so great that it looked like I had bought it from the store that color. The adhesives I used to apply and piece together my card are Elmer’s Tape Runner, Xyron Sticker Maker, and Elmer’s CraftBond Foam Mounting Tape (used on the cat). A little tip that makes ribbon super easy to put on, run it through your sticker maker. Now enough about my card, lets get on to the freebie. Please, please comment below and let me know what you think of my files. When you click the “Download Here” link below the picture it will take you to the download (Google Drive) once you are there, click the upside down arrow at the top of the page, then it will download. The freebie includes SVG, Digi Stamp, DXF, JPEG, PNG, and Print and Cut Files. ** Please note, each freebie download will be available for 2 weeks so make sure you get it while you can. Thank you for stopping by and I really hope you enjoyed this post.